In a small corner in the northwest Shibuya in Tokyo, west of Yoyokgi Park, there’s an interesting cluster of coffee shops, including the new branch of Switch Coffee Tokyo opposite Yoyogi-Hachiman station, another new arrival, Coffee Supreme Tokyo, and old hand, Fuglen. 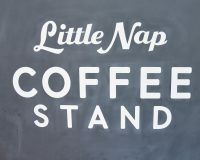 However, one can argue the trendsetter that started it all is just a little north of the station, where you’ll find a tall, thin building backing onto the railways tracks, home, since 2011, to Little Nap Coffee Stand. Little Nap now boasts a roastery a few minutes’ on the other side of the station, but this is the original, a narrow, wedge-shaped space that serves four seasonal single-origins on pour-over (hot or cold), an impressive output for an infeasibly small space. When it comes to espresso, there’s the house-blend, available as espresso, macchiato or Gibraltar (the first time I’ve seen that in Japan outside of Blue Bottle Coffee), all served hot and only available if you’re sitting in. If you want a longer drink, there’s a choice of Americano, latte (hot or iced) or cappuccino. There’s also cakes, sandwiches, ice cream and a selection of retail bags to take home with you. Little Nap’s also crammed in an impressive sound system!